I found that there are many Swarovski stores having a promotion on Swarovski crystallized wine sleeves. I am not sure if this includes authorized retailers or if it is strictly boutiques. What I have learned is that the promotion runs December 5 through December 11, 2011. 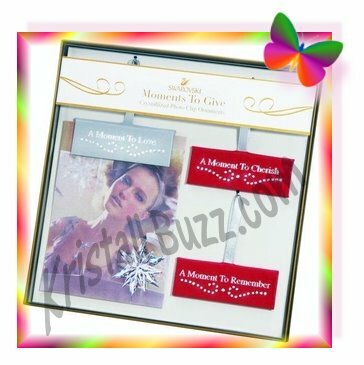 The set of 3 crystallized wine sleeves will cost $15. The Swarovski wine sleeves are an OPTION to purchase when a customer makes a qualifying purchase of $150 or more. 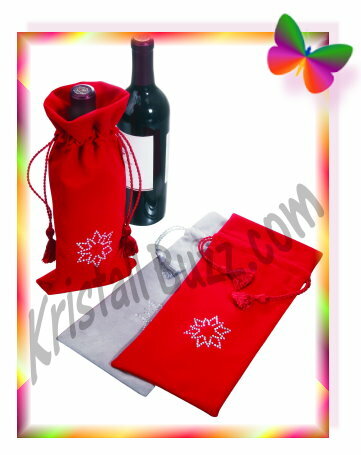 In the Swarovski Crystalllized Wine Sleeve set, there are three sleeves. Two of the sleeves are red, and the third sleeve is gray (or perhaps white?). All three sleeves are decorated with a crystallized star on the front and close with a deluxe rope. The Swarovski Crystal Wine Sleeves would make a terrific accessory with someone’s favorite bottle of wine as a gift this Christmas. If you are looking to make the occasion even MORE sparkly, you can add a set of Swarovski Crystalline Red Wine Glasses or Swarovski Crystalline White Wine Glasses . Cheers to a safe, happy, and sparkly upcoming holiday season! Yesterday, Swarovski posted their first weekend (of 3 weekends) special, which is promoted as a limited edition jewelry set. Per Swarovski’s announcement, there are 500 sets available through Sunday evening or until they are sold out. This limited edition is the Swarovski Eros Set. This jewelry set is a red pave heart on a silver-colored chain complimented with a pair of matching pierced earrings, identified as Swarovski # 1028256. The price is $160 for this Swarovski limited edition set. Swarovski has been issuing email vouchers. I don’t know if this limited edition jewelry is excluded from the discounts that can be obtained using the vouchers, or if it is exempt from them. If you like the pendant, but don’t have pierced ears, you may be happy to know that the Swarovski Eros Pendant can be purchased separately. The crystal giant also offers the Swarovski Eros Charm which can be attached to a bracelet or chain. Hoping that all Swarovski crystal collectors had a Happy Thanksgiving! On November 16, the 2011 Star for the Rockefeller Tree was revealed by actress Olivia Wilde. This is the eighth year that Swarovski has held the honor of designing the Star to be placed on the Rockefeller Tree. I found a video on Bing where the Today show hosts interview the actress about the Swarovski Star: Bing Rockefeller Star Video. The 2011 Swarovski Star has 12 rays outfitted with 720 LED bulbs. It is over 9 feet in diameter and 18 inches deep. And the weight….I don’t know how they keep in on the tree….550 pounds, which includes 300 pounds of crystal! The Swarovski Rockefeller Star uses a computer program plus and 25,000 crystals (over 1,000,000 facets) creates an amazing sparkling light show to captivate the Christmas audience. The effort behind this glittery giant star is equally impressive. Nine people spent 1200 man-hours, setting up, analyzing, and assessing the star to make certain it would perform in all variations of New York City’s winter climate. The Swarovski Star Ornament is now on the Norway Spruce, which stands 74 feet tall, where it will remain through the end of the 2011 holiday season. Visitors can see the lit tree through January 7, 2012 5:30am – 11:30am. There are special hours on Christmas and New Year’s Eve. The Rockefeller Tree Lighting ceremony will be Wednesday, November 30, 2011. The event will be broadcast on the NBC network 8:00 – 9:00 EST. Swarovski crystal fanatics should program their DVR for this event! This year, for the first time probably ever, I’ve decided to try and get a head start on my Christmas shopping. And for once, I actually have some good ideas for my kids and family. Now, the challenge will be to stay within the budget. Today, I got an email from Swarovski about an online Christmas voucher good on crystal purchased in the online store! Yeah, save money! I recalled receiving the voucher in 2010, so I checked the Kristall Buzz archives to see what offer they gave us last year. So, in 2011, we have a 10% voucher as of November 22. In 2010, Swarovski provided a cyber-Monday voucher for a $20 credit valid on cyber-Monday only. Swarovski also provided a 20% voucher as of December 7, 2010. So, I’m wondering if Swarovski is giving us a smaller voucher earlier, or if perhaps more and larger vouchers are yet to come? Swarovski Crystal Fanatics should definitely check their email for the voucher code before heading off to do shopping in the online Swarovski shoppe! I found this slide show of the Christmas tree. Swarovski Crystal Wish Tree Slide Show. Can you really imagine 44,000 Swarovski Ornaments on a Christmas Tree? WOW! I’m sure that Swarovski will be decorating lots more trees, so look for more Swarovski Ornaments on trees at the Kristall Buzz! Our favorite crystal brand has produced some Swarovski Pill Box figurines in the late 1970’s and early 1980’s. The Swarovski pillbox is something that has been rarely seen in the 15 years that Crystal Exchange America has been in business. The popular Swarovski book, Warner’s Blue Ribbon Book on Swarovski Crystal, indicates that Swarovski pillboxes have been produced in various sizes. They document the Swarovski pill box in both a 30mm (1 3/16”) and 50mm (2”) diameter size. They also document the Swarovski pillbox with a gold-colored finish and a silver-colored finish. And lastly, they document the crystal pill boxes to be with separate tops and bottoms or that the lid and base are hinged together (like some of the coin boxes). The Warner’s books show Swarovski-assigned part number of 7506MR030 for the 30mm pill box and 7506NR050 for the 50mm pill box. They assign a Swarovski ERV of $525 for the small pill box and $650 for the larger pill box. It is believed that the pillboxes were produced with numerous different city names as souvenir gifts for vacationers. With this brief overview of the Swarovski pillbox, we can share that we do have a pillbox in on consignment that is available for bidding on eBay. This pill box is in a rust-colored ‘Swarovski Souvenir’ box, with grey foam support and cream-colored lid ends. The pill box itself is 30mm in size and is highlighted with a silver-colored finish. It is a hinged pillbox. This pillbox has a painted decoration in the lid of the pillbox, along with the word “Innsbruck”. This pillbox does not have any type of Swarovski logo on it. The sticker attached to the box says “PILLEND 030 IBK”. The auction # for the for the Swarovski Crystal Pill Box is 140643986108. It will be interesting to see what kind of interest there is from Swarovski collectors on this unique crystal item. Best of luck bidding if this is a Swarovski collectible you have been seeking for your crystal collection! Swarovski CrystalograMs are some of the more unusual items produced and sold by the crystal giant. Essentially, they are a work of art extending across a canvas medium that extend onto the frame, and accented by Swarovski crystal stones. A more extensive article on the Swarovski CrystalograMs can be found on the Kristall Buzz. While there is not much information on the internet or in books about the limited edition Swarovski CrystalograM pictures or the artist who created them, there is official Swarovski literature presently on eBay about the collection also known as “The Five by Weidinger”. This literature is likely something used by a salesperson advertising the Swarovski CrystalograMs. The literature is nice, and in decent condition. 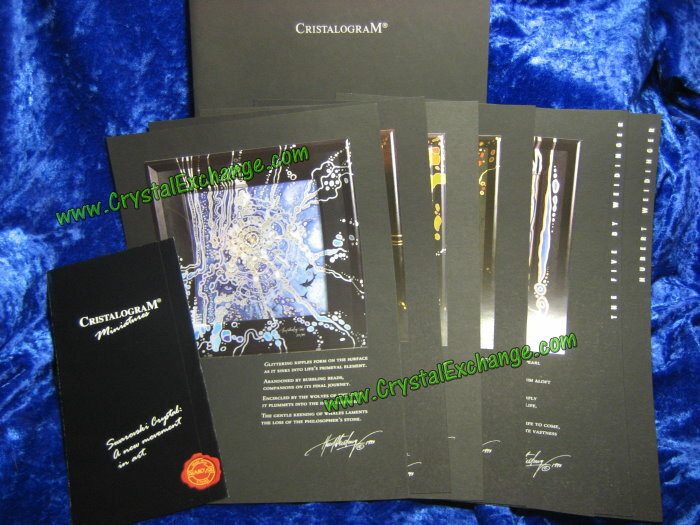 In addition to the brochure for “CrystalograM Miniatures”, there are separate pages with fairly large photos attached for each of the five CrystalograMs produced by Swarovski included in the folder: Air CrystalograM, Earth CrystalograM, Fire CrystalograM, Nature CrystalograM, and Water CrystalograM. The auction for the literature has a low starting bid and includes free shipping via US Mail. Any Swarovski crystal fanatics that may be interested in this sort of thing should check out the auction for the Swarovski CrystalograM Literature on eBay, item #140643320983. The auction closes in the evening of November 21, so don’t delay! Swarovski News: Limited Edition Swarovski Weekend Specials return in 2011! Yesterday, I received my Swarovski news email, which was mostly about jewelry products that might make good Christmas gifts. Also, in the email, was an announcement that they are doing the ‘limited edition’ weekend specials like they did in 2010. Additional information about the 2010 event can be found in the Kristall Buzz article: Exclusive Limited Edition Swarovski Jewelry at Swarovski’s Online Event. In 2011, starting on Friday November 25, the crystal brand will offer a Swarovski limited edition jewelry item (they say limited to 500 units) that will be available through the weekend or until sold out. The crystal brand has 3 different jewelry designs that are each offered weekend only. The second weekend event will begin December 2 and the final weekend event will begin December 9. From the Swarovski crystal image, it appears that one item is a dark blue pendant. Another item may be a red pave heart necklace with earrings. And a final item may be a clear pave star with earrings. There is no mention of price or in what order the jewelry items may be presented. This is an online event, and the limited edition offerings cannot be purchased anywhere other than the Swarovski online shoppe. If you are signed up for the Swarovski email newsletter, you should be notified when the specials begin each weekend. Crystal Exchange America will run some specials leading into the holidays, so be sure and watch the Kristall Buzz for announcements or follow Crystal Exchange on Twitter for extra Swarovski News! On November 17, 2011 Swarovski will light up the Swarovski Crystal Wish Tree at the Toronto Eaton Center (Toronto, Canada). Swarovski has collaborated with the Children’s Wish Foundation of Canada since 2005 supporting the organization and contributing generously to help the foundation grant wishes to children and their families across Canada. This year’s limited edition Swarovski ornament resembles the Swarovski Festive Tree Ornament . For clarity sake, I’m going to describe the Festive Tree Ornament first. The Swarovski Festive Tree Ornament is green (peridot moonlight), decorated with red and yellow ornaments. It is about 1.75” tall and retails for $40 in the online shoppe. The Swarovski 2011 Make a Wish Ornament is tree-shaped, but is clear in color with no colored ornaments. It has a special inscription with the year 2011 underneath. While I have not heard the 2011 maximum quantity of production, in years past, 1100 to 1200 of the Swarovski Wish Ornaments have been produced. The Kristall Buzz has pictures of some of the past limited edition Wish Ornaments in the article entitled Swarovski Crystal Wish Tree Ornament available in Canada. There were 1200 limited edition ornaments produced in 2010, which resembled Samantha the Snowflake. There were 1100 limited edition ornaments produced in 2009, which resembled the Swarovski Little Snowflake Ornament (retired in 2008). There were 1200 limited edition ornaments produced in 2007, which resembled the Swarovski Twinkling Stars Ornament (retired in 2007). Honored wishes and additional information can be found at the organization’s web site: Children’s Wish Foundation. I’ll post more details about the Toronto Eaton Center Tree lighting and Children’s Wish Ornament following the event in a couple of days. I’m looking forward to seeing the Swarovski Limited Edition Ornament soon! Some of our crystal fanatics clients recently attended the Swarovski Signing Event at Sofitel in October, 2011. They were kind enough to provide us with the Swarovski Event Summary to share with other Swarovski collectors. We have since received more emails and images about the wonderful signing event and fantastic stories from those fortunate enough to attend the event. 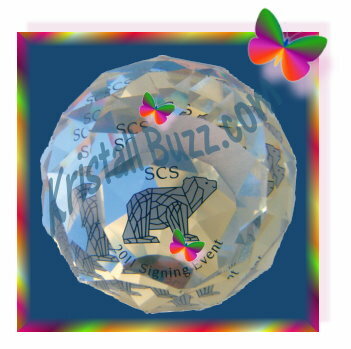 At the recent signing in Los Angeles, California held at the The Sofitel Hotel on Beverly Boulevard, Swarovski held true to their tradition of gifting a special Swarovski paperweight each registered SCS member attendee. The 2011 Swarovski Signing Event paperweight is 40mm in diameter. 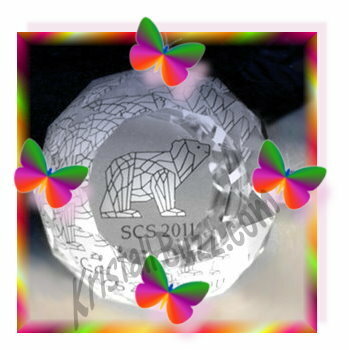 It is Crystal CAL in color and bears (pardon the pun) the design of Swarovski Siku the Polar Bear. Look at the Swarovski Polar Bear Key Ring – the Hong Kong Gift with Purchase promotion – and you will see the same design. The Swarovski-assigned identification # is 1153341 to the 2011 event paperweight. I know that the event was not cheap to attend….air fare, hotel stays, meals, event fees, etc. However, now, it is starting to sound like attendees were showered with beverages, Swarovski crystal gifts, and quality entertainment….the Hollywood atmosphere was created by the Hollywood look-alikes included not only Lucille Ball, but also Whoopi Goldberg, Jack Nickolson, Johnny Depp, and others provided by the Sennet Entertainment group. It seems like the WOW-factor was there and that Swarovski SCS members definitely got their $$’s worth! Our favorite brand Swarovski is seems committed to getting our attention on our iPhones (including iPod and iPad) and Android Phones. This is the 2nd App in 2 months that Swarovski has launched to keep us playing their crystal games. 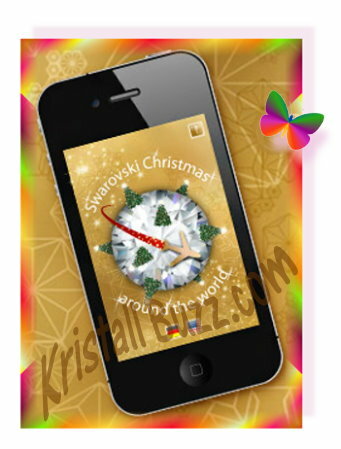 The newest app is the Swarovski Christmas Around the World App. Since it was free in the App store, I decided to ask my daughter to take it for a test-drive. She says the instructions were simple, and the concept is easy to catch on to. Of course, the longer you play, and the higher the score, the more difficult the tasks. The Swarovski Christmas App for smartphones has a total of 6 color-coded characters, but at the easy levels begins with 2 people to receive gifts. The idea is to give the Swarovski crystal gift to the correct recipient (because recipients and bubbles are color-coded) before the gifts disappear. But there are NON-Swarovski gifts that should NOT be given to the characters, so you have to pay close attention to the gift in the bubbles. As various levels are completed the number of recipients increases and the speeds that the bubbles appear / disappear change, making the levels more difficult. Adding even more complexity, later in the game, some of the bubbles are gray, meaning you have to figure out the correct recipient for the gift during the play. 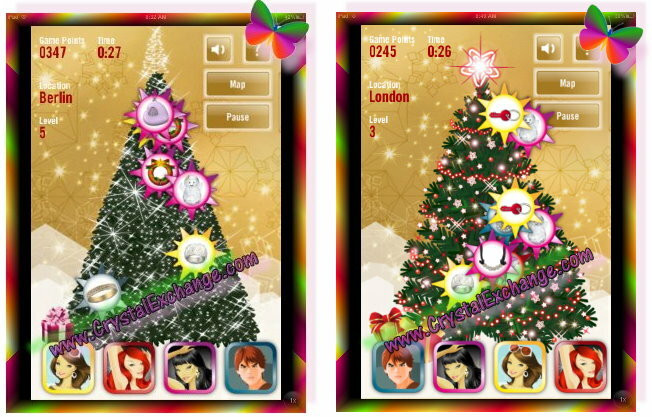 The Swarovski Christmas App features Christmas trees in a number of cities: Innsbruck, London, Berlin, Zurich, and Madrid. It appears that points must be used to purchase flights to other cities, but my daughter did not expand on how that worked. She stated that high scores can be included for world-wide display, and that this does enter you into drawings for Swarovski prizes. Whew hew! More Swarovski crystal! In the game, it is possible to view more information about the Swarovski crystal gifts in the bubbles, and add them to a personal wish list, which can then be emailed to your friends and family. We tried this…but the links to the Swarovski crystal wishlist products in the recipient’s email did not seem to work on our attempts, so I’m not sure that this feature would be all that useful. Summary, the game is fun! Great job to Swarovski and the app developers! Also, check out the Swarovski Refract App that launched near October 9, 2011. Can’t wait to see future FREE Swarovski Apps!